I am so excited and relieved to find out about Synesthesia…I have known certain letters, numbers, days of the week and months had specific colors my entire life…and the colors have never changed or varied. I remember mentionaing it to my mother when was just a young girl, and her reaction…that SHE didn’t see things that way…was such a surprise to me. Throughour my growing up I occasionally would mention it, very tentatively, to see if anyone else related colors as I did, but never found anyone. I thought it was just an odd quirk…even had a psycholigist tell me that it wasn’t anything…just a sign that I was creative. I accepted that and always felt different, but somewhat special at the same time. What a surprise to find that not only are there others like me, but it has a name: grapheme to color synesthesia! Hooray! Thanks for the comment! Glad we could provide you with some useful information. There are many others that have experiences that are very similar to yours! If you’re interested in sharing your experiences with our blog (anonymously or not), we’d love it if you contacted us through our contact form! I see numbers in color, but only if I think about them ie. they do not appear in color if typed black on a page, for example, as in your test. 2 is always yellow, 4 brown, 8 red, and yellow x brown has always equalled red … of course! 3 is pink, and 6 and 9 are a kind of light blue … and they are related … which makes “sense” to me. 5 is orage, 1, 7, and 0 are black. I thought everyone saw the same, until I walked past a TV one day where a commentator said “Some people see numbers in color” … and I stopped in my tracks and said aloud “WHAT”? Am a professional artist and neurologist and give talks on “Art and the Brain”. Am intersted in this. I recently heard a friend describing the symptoms of her synesthesia. So I looked it up. This test is incredibly clear. I can’t believe it. I had always had distinct associations between colors and letters, numbers, days, and months, but I always thought that everyone had this, since my mother and discussed similar experiences. It’s amazing to learn that NOT everyone does. I thought it would only count as synesthesia if you actually SEE the colors, rather than just THINKING of them. This is very interesting, and gratifying to learn, as I have been interested in synesthesia for a while; secretly wishing I had this sort of experience; now I know that this normal part of life is actually IT. Thank you. Also, my mother and I both have personalities for numbers. What is that? Thanks for the comments, Aka. It may be some form of ordinal linguistic personification! It’s pleasant to see radiant colors as I type or read. I could go on and on. An example, license plates being pretty or awful. We had a car years ago that had an awful license plate (color). It actually ruined the look of that car. Awesome share! Your comments on license plates bring to mind all of the different places that letters and numbers appear, and how grapheme-color synesthesia might change the way one perceives these things. Billboards, book covers, movie subtitles. Quite a pandora’s box, actually. Thanks again! Thanks for the comment, Lila. No problemo! Hello! So yesterday is when I began to think I might have an extremely mild case of synesthesia. 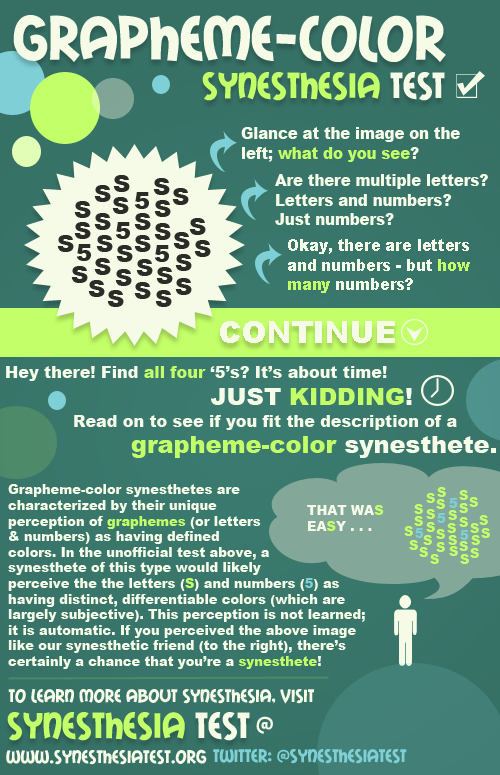 As I researched grapheme-color synesthesia I felt like I have it, but also was unsure. Take your test, for example. All the S’s and 5’s were black to me. Nothing /looked/ different to me. I don’t see the colors nor do I perceive them like that. I merely associate some numbers with colors. like, in my mind 5 is the color blue, but not VISUALLY, if that makes sense. Is this still the synesthesia or just a quirk? So not only do I have Synesthesia, but I also have Dyslexia. I didn’t realize I had either until later in High School because the Synesthesia translated the letters and words into colors, so I didn’t have to see the individual letters themselves. This only became a problem when the colors of the words was almost the same. For example, immortal is a pinkish-purple and immoral is two shades more purple. I have also noticed that the Synesthesia has turned me into a speed reader. For example, a trained speed reader (my sister) can divide the page into six sections and then read the different sections and then their brain puts the words into coherent order for them. I realized that I divide the page in half and look at the sequences of colors (words) on the top half, then the bottom half, then the meaning comes alive in my head in the form of a moving picture. It’s just really interesting. I used to always say things like “Lower it louder” or “make it deeper” when i was little listening to the radio in the car and my parents used to correct me and i got confused. Then one day I saw some national geographic thing on some person who had synesthesia and i freaked out, i thought it was normal! Also, some certain numbers and letters stand out. Not all of them though, just o, a, r, i, 7,4, and 1 are the most intense in color so its easier for me to see them… i dont know. I also was un-aware that this actually had a name and happened to other people! I’ve found that I have synestesic qualities and I’ve know about it for years, and knew that my sisters and friends didn’t think this way, but I figured it was just some weird quirk I developed. Often when learning people’s names, I can’t remember the specific name, but I can remember the color or the feeling of the name. So I can easily rule out which names it is NOT. I am a musician as well, and I remember learning my scales and practicing them by making note cards with the scale name written in the color of the key signature. For the most part, sharp keys are shades of orange red and yellow an flat keys are blues and greens. When I would tell mysel that the B major scale was completely orange, I was able I learn it quickly and with no problem. These toe of color schemes are also the case when memorizing lines for a play. The color of line line changes based on. How long it is, where on the page it is located, and sometimes the subject in te line bein memorized. I can also assign colors to letters of the alphabet (some being easier and stronger than the others). For example, A is always red. E is always blue-green. C and S are always orange or Yellow. J is definitely orange. O is white. But R can be maroon or green depending on the word it is used in. Days of the week also have colors. So do school subjects (I am a college student). If anyone out there has similar experiences please let me know! As I said, sometimes it is harder to tell the colors of certain words or letters, but when I am absolutely sure, it makes me sick to my stomach to switch a color. Never write the Gb major scale in orange ink! i just recently came across this and it’s interesting to see the other comments from people and see what colors they see when looking at numbers/letters. I only realized a few yrs ago that there was a distinct and consistent color to my numbers/letters. It’s ingrained enough that I will occasionally say a number instead of the color that I mean. I’ve been known to say a traffic light was a 6 when I meant green. It has also proven useful in remembering number sequences. I like this test but for me 5 & S are the same color so it didn’t work very well. It does get the point across though which is nice. Hi! I have known that I am a grapheme-color synesthete for about a year now. I first noticed my symptoms, though, when I was younger. A friend of mine was writing the letter ‘A’ in green crayon, and I told her that it was “wrong” and should be red. Recently, I have come to the realization that I also associate some tastes with words or color…For instance, the month of June tastes like cream. There is also a special relations synesthesia where certain things have an actual special perception. An example would be that when I think of a particular day of the week or a month, some are “farther away” than others. July is farther away than January, and so on. Also, do you think that being a synesthete is what makes me an artist? I have always thought of numbers as having colors, although I don’t actually see the colors. The colors have remained the same since I was a child. I am 71 now, and self-diagnosed as Asperger’s. If I see a number like 46, I think, that’s a nice combination – red and yellow. My colors are totally different than what other commenters have reported here. It’s really awesome to find out there’s actually a name for this! I actually never mentioned this to anyone (because I thought it was normal) until about two years ago when I was talking with my mom and I told her O is black and E is green. She looked at me like I had three heads! I’d accepted that it wasn’t really there, and just thought it was some leftover quirk from an overractive imagination as a child, but to find out that there is a name is so amazing! I hope that more research is done into this condition. I’d love to know more! But not just numbers and letters have colors, so do days of the week, months, times of day, school subject, meals, rooms of the house, compass directions, even songs! The letters also change color when they are put in words. When R is alone it is red, but in the word break it is green. It’s so amazing all the dofferent things our brain does! I’m curious and i want to find out if grapheme-color synesthesia applies to me. I’ve always associated colors with numbers, letters, words, days of the week and months…..examples go on. A is red, b is orange, c is green. 0 is black, 1 is brown, 2 is lighter brown, three is yellow ex. It’s never changed. The color of a word would depend on the first letter, for example the word “apple” would be red because the first letter is A, which is red. The same thing would go for moths or days of the week. Is this grapheme-color synesthesia? I took the Battery Test on synesthetes.org, and I scored as a grapheme-colored synesthete in all mini-tests I took. I never really realized I had synesthesia, but now it’s so obvious: the number 3 is clearly green, for example, and the letter n has always been red. I remember accounts of this since I was six years old (like I was trying to explain how the number 3 is obviously green to my babysitter at that time)! When I told my friends and my sister, they denied it, thinking I was trying to be “cool”, but I know I’m not just imagining things. I like having my relatively mild case of synesthesia. What do you think? i’v have this too, and i read the comments, everyone has described similar things which have happened to me too. For example i thought it was normal but my parents thought it was strange. But there are certain ones i can not figure out. its like they have a colour but i cant name it or see it. a=red, b=blue, c=yellow, d=dark purple, e=yellow, f=green, g=purple, h=light blue, i=light blue kind of, j=purple, k=green, l=reddish purple, m=reddish purple, n=maroon, o=clear, p=red, q=green, r=greenish yellow, s=yellow, t=green and purple but not mixed, u=purple, v=reddish purple, w=green, x=maroon, y=green, z=purple. i also assign personalities to music notes, numbers (+ colors), and some letters. is it a thing with synesthesia where we confuse letters and numbers? i confuse F and 5, A and 4, because of similar shapes and the same colors. am i just being crazy on that one? This is so fascinating. Just a couple of days ago My 11 yr old son told me he sees numbers as colours. Any advice? I remember seeing patterns and associations in numbers as a child, but I think I grew out of it, or forgot how to do it. OMG. i am 80 years old and have always felt and seen words, people, concepts, experiences etc in color. i truly thought everyone did. i know both of my sisters did; one an artist and the other an accomplished musician. i remember well the day when i was about four and explained in great detail to my mother that my name was yellow. She did not disagree. I am trying to figure out if I have synesthesia. I associate colors to numbers and letters and the colors have been consistent for as long as I can remember, but according to the test provided I am not a synesthete because I do not see the colors. Do people with grapheme-color synesthesia literally see colors on printed paper or do they just see it in their mind? I see the colors in my mind. If someone were to ask me what color A is or what color the number 5 is I wouldn’t hesitate to answer. Is this different than synesthesia since I do not see the colors if they are printed on paper? Hello! My friend and i took this and were wondering; does it have to be visual? I saw the numbers in black, and my perception doesnt change, but in my mind, when i do math or think about days, numbers, letters, etc. I see them with colors and personalitys. If it doesnt change my direct perception, just the image of them in my mind, does this count? Is there some other thing that does that? I have lexical synysthesia, which includes grapheme color synysthesia. I am not sure what category I fit in. I do not see numbers in color. I definitely passed the test of 5’s.What happens to me is involuntary. When I am most relaxed I see colors when my eyes are shut. It is often like looking into a kaleidoscope or watching a lava lamp. It is very relaxing although I am never asleep when I have these wonderful moments. I am artistic and very good with the written word. One of my five children has the same sense and he is a working artist. I always thought this happened to everyone but since having acupuncture I have learned it only happens to a select few. Anyone else see colors behind closed eyes? I love being a grapheme-colored synesthete!! My sister thinks I’m trying to be “cool”, but I actually do associate colors with numbers, letters, days of the week, and months. Two of my friends actually happen to be synesthetes as well– one has personalities as well as graphemes while the other can sometimes see sounds as well as have grapheme. I also just found out my dad has synesthesia just a few hours ago!!! Does anyone else clearly see letters/ numbers in black but can see the associated color almost tinting the character, in a way? Kind of in minds-eye, kind of not. I have grapheme color synesthesia (it’s more prominent with numbers than letters for me though) but the test with the S’s and 5’s confused me because they are both red to me. The colors of letter aren’t as clear and sometimes change, but numbers are always really clear and stay the same. 1 is black, 2 is yellow, 3 is light pink, 4 is blue, 5 is red, 6 is purple, 7 is dark blue, 8 is dark green, and 9 is brownish-orangey. 592846 looks like a rainbow to me. I think I might have some form of synysthesia… I have a personality for each number. What would that mean? I am not sure if I have synesthesia or not, because I do associate colors with letters and numbers, but only some colors. The colors have not changed, and I do show some symptoms of synesthesia, but the color sensations are not strong. To me, A is red, B is a dark blue or purple, C is white, D is dark green, E is yellow, F is lime green, G is orange…etc. I think I have seen letters this way my whole life, although I never realized it until I read the book “A Mango-shaped Space,” by Wendy Mass. I found myself disagreeing with the main character’s (who had synesthesia) interpretations of the colors of people’s names. This is so cool! I think I might have synesthesia. Letters, numbers, months, days of the week have colors. Some are stronger than others (like Wednesday is definitely orange but Sunday is kind of has some essence of blue) but I don’t see them projected into space, they are more in my head, like in my mind’s eye. Does that count? Not all words have colors, just some are obvious (like the word basic is light blue, the word life is kind of a mish mash of the colors of the letters that make it up). Anyone who sees the letters in black but just KNOWS they are colored is still a synesthete. This is called associated synesthesia. Anyone who actually sees them in color has projected synesthesia. I have associated synesthesia. For me, A is dark yellow, almost black, B is dark green, C is orange-yellow, D is deep blue, etc. Also, my numbers have colors, like 3 is lilac, 4 is cornflower blue, 5 is sunflower, 6 is firetruck red. 7 is the prettiest, it’s a shiny green with a hint of blue. They also have personalities, like N is green and sporty and L is purplish-pink, creative, and shy. Hi there, I have grapheme-colour synesthesia and so does my dad. I didn’t realise others didn’t do this until I was in my late teens, and then only discovered my dad does it when I was in my 20s. My only issue with it is with how I perceive time. I see a mental map of days of the week, months of the year, and of years themselves. So I literally see my life mapped out, which I don’t enjoy! I get very hung up on time and I’ve recently realised this is why. Apart from that, no issue with it. Just a colourful experience! I’ve had Grapheme-colour synesthesia ever since I can remember and I thought it was normal. I tell my parents about it a lot, but they never seemed to understand what I said. Then I saw a documentary on someone who could see colour in things like words and sound and how fascinating it was, and I was like ??? I thought it was normal ??? So I can see colours in words, numbers, letters, etc. for example, a is pinky red, i is a very light purpley white, s is light blue, 7 is dark green, 6 is a purpley pink, etc. But words are cooler. Words can be pretty or ugly. For example, the word ‘India’ is actually really pretty and colourful. Each letter plays a part, the word starts off blue, then orange, purple, blue and then pinky red. Then, when I am trying to remember a word, like a name, I often get the first letter wrong. Like, I’m trying to remember the name “Andrew”, and I think it starts with the letter r, but it doesn’t. But I think this because the letter a and r are similar colours. Also, when I’m recalling a memory, a mix of colours will pop into my head. And when I look at an object or hear a sound, I get a strange volume/ shape of colour in my head. For example, maybe if I hear a part of a song, a shape that starts off jagged and dark blue, and then gets bigger and orangey-pink will appear in my head. Does anyone else see certain combinations of letters in color? My most frequent one is ‘kijiji’. (An ad site, something like craigslist) I see the string of i’s and j’s in green. It’s important for people to know that those with this type of synesthesia still see those letters and numbers, visually, as black. It’s not like people with this synesthesia visually see different colors than other people. It’s about what people see in their mind. Like when I look at those letters and numbers, they are black. I am visually seeing black. But if I were to imagine an S in my head, I imagine a blue-colored S. If I imagine a 5 in my head, I imagine a yellow-colored 5. Of course, every synethesiate is different. But I hope this makes sense. 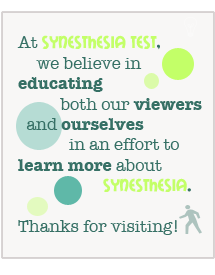 Therefore, this “test” to see if you have synesthesia is not very good. When I took the test just now, the 5s jumped out of the page slightly (like the print was raised) and I could just tell at a glance that there were four of them. What the heck is that? Many of the posters here have noted that they associate the letter “A” with the color Red. Has much work been done to find out if that association is more common, or even universal … in which case, does the letter A have some inherent redness to it outside of individual perception or are we all socialized the same way in a given culture. What does a native English speaking synesthete see when they look at Japanese characters? the left side of my back feels green or blue (Depending on my mood), and the right side feels like red stained glass, like its kind of see through.